When most people remodel their house, old building materials wind up in a large dumpster and eventually a local landfill. 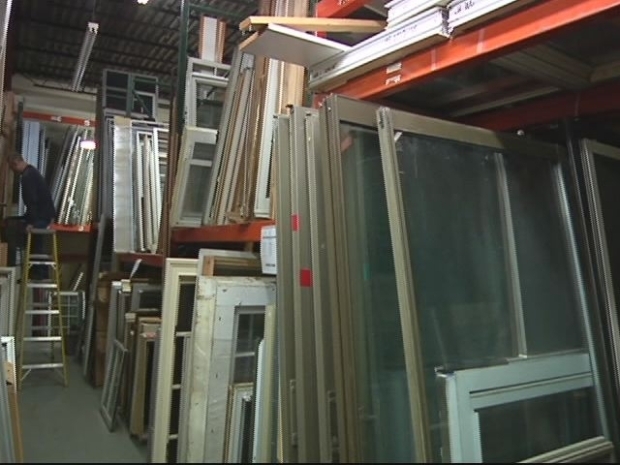 The ReCONNstruction Center in New Britain takes in things including roofing, doors, windows, toilets and lighting fixtures and resells them to people looking for a buried treasure or a bargain. "The ReCONNstruction Center is an environmental nonprofit. We've been around for about 5 years," said Doug Janssen. Inside the warehouse you can find just about anything from a dusty sink to a $4,000 alabaster chandelier. Most of the donations come from homeowners, but some come from small contractors. All donations are tax deductible charitable donations and the nonprofit provides a receipt. A new non-profit recycles some building materials and fixtures and re-sells them at bargain prices. Some donations are smallm while others are very generous. One West Hartford company donated $150,000 in vinyl siding, roof shingles and shudders. Other donations include entire sets of kitchen cabinets, which tend to fly out the door quickly. "Most of the stuff would wind up at the dump if it didn't com here," Janssen said, "That's our mission, to keep the building materials out of the landfill."